On this day last year (9th September) Nicole Richie gave birth to her second child, a beautiful baby boy named Sparrow. Sparrow weighed 7lbs, 14oz at birth. During the past year he has enjoyed traveling with his mom, including a trip to Paris. Earlier this week his doting parents threw him a star studded backyard bash to celebrate his very first birthday. 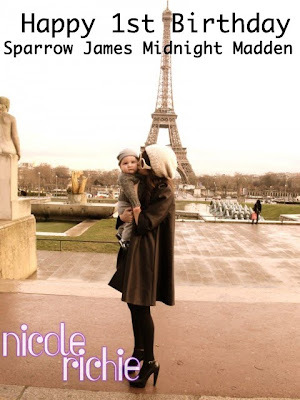 Nicole once explained her son's unique name, saying, "Sparrow was one we both liked. I liked the way it sounded with Harlow, and there's the Captain Jack Sparrow connection." Sparrow's Daddy Joel posted this picture (below) and also a message for Sparrow over at www.goodcharlotte.com." Ohhh what a lovely baby!!! !a very sweet baby!! !he looks like his father!the same! He is a munchkin. so sweet. Does look like the Madden brothers.